The Aldermaston Players web site is at aldermastonplayers.co.uk. An offbeat, hilarious murder mystery farce, complete with mistaken identities, six million bucks in diamonds and a corpse in a wheelchair. Most performances include a meal. Aldermaston Parish Hall, The Street, Aldermaston, Reading, RG7 4LW. Book tickets via the web site or call 0118 981 5815. 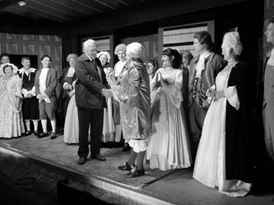 At the opening night of their production, A Laughing Matter, at The Barn, Frouds Lane, Henry Hawes of the National Operatic and Dramatic Association (NODA) presents Aldermaston Players with the 2012 NODA (London Region) Constance Power Trophy for 'the Society Most Worthy of Encouragement'. Chairman Chris Boott receives the trophy on behalf of the Players. NODA are the national body for amateur theatre in the UK which Aldermaston Players joined on becoming an independent organisation in September 2011. 13th to 14th July 2012.
Review from the an audience member. The show must go on. If ever an old cliché summed up a bravura performance in hostile conditions, this was it. As the curtain went up on the Aldermaston Players' open-air production of A Laughing Matter in a field at Meadow Brook (halfway between Reading and Newbury) the heavens opened and we were treated to a prolonged cloudburst. Nevertheless on the show went, virtually inaudibly at first, but soon becoming clearer as the rain relented. The Players assembled a populous cast with varying degrees of experience, some 'doubling up' to play more than one role. As Garrick, the greatest actor of his generation, Graham Jerome was suitably 'theatrical' where necessary, as was Tom Shorrock in a hilarious depiction of the winning, impetuous Goldsmith. This pair were ably supported by Chris Boott as Boswell and Nigel Wilson as Dr Johnson; there was an affecting performance by Chris Faulkner as hapless Charles Macklin (Garrick had stolen his thunder!) and a well over-the-top cameo by Tricia Goodchild as the lubricious Lady Kingston. Everyone contributed commendably, Cath Hannon deserving a special bouquet for her superb comic timing and perfect diction in the roles of Hannah More and Mrs Woffington. Even under the trying conditions, she held it together. The staging, beards, wigs and costumes were brilliant, even if the front row of the audience were sitting more than the length of a cricket pitch away from the stage; and the play itself highly diverting and original, with historical characters mouthing modern idioms at times to great humorous effect. The result was a superb evening's entertainment that began in a rainstorm and ended with moonlight on a muddy moat (well, almost). The old adage from the stage that you should always leave the audience wanting more may well be correct; however on this occasion, while the play itself was long, its run was sadly short, as punters were only offered two chances to see this production. I would urge the team to seriously consider a re-run at the earliest opportunity – this time perhaps at an indoor venue? Anyway, as winners of this year's NODA award for Best Newcomers, whatever this resourceful group of performers chooses to put on in the near future should be well worth watching. Oh, Coward!, 17th to 18th and 24th to 25th February 2012. See the review in the Archive. Art and Man's View, 3rd to 5th November 2011. See the review in the Archive.